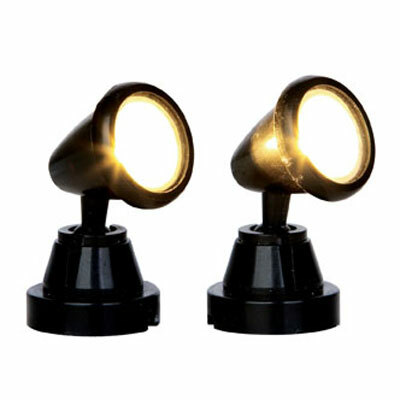 Lemax Round Spot Light Accessory provides two miniature individual floor standing powered spot lights, suitable for uplighting Lemax buildings to compliment your miniature village display. Scaled and themed for placement in and amongst a Lemax village scene to add illumination and realism to a street setting. The rounded spot lights are battery operated as standard, powered by an external battery pack (AC mains adaptable) with wire length suitable to hide battery unit from sight in a display. Included in this set are 2 x 3.5cm self standing lighted accessories which joined the Lemax Village collection in 2014.